This beginner-to-intermediate course helps put Adobe Illustrator’s power and flexibility at your disposal, starting with an overview of the program, from navigation to sending final artwork. In this hands-on session, you’ll become familiar with Illustrator’s graphical user interface and workspace, and you’ll explore the basic elements that make up vector graphics: paths, strokes, fills, anchor points and typography. You’ll also learn how to use each of the program’s powerful drawing tools, including the pen tool. You’ll explore tracing bitmap images, manipulating typography, trapping colors for print, and creating color separations for multi-color imprints. You’ll build gradients and halftones, and then apply these features to objects and text to create professional-quality artwork. We’ll also highlight some of the most popular features in Illustrator, including The Envelope Warp menu and distorting and transforming objects. Finally, you’ll create a logo and set it up to easily print for decorating almost any product. Start here for everything you need to know to create vector artwork for your imprints. what kind of return on investment to expect along the way. From garment decoration to decals and large banners, you can become a one-stop shop for all of your customers’ needs. Stahls’ educators will show you how to diversify your decorated-apparel business, and will share their expertise on how to print any full-color logo for any customer. From cotton and polyester to leather, neoprene and more, you’ll discover the tools and skills needed to print your way to big profits. 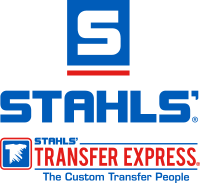 Whether it’s ordering banners and digital transfers, or purchasing a print/cut system to print them all in-house, Stahls’ experts will show you how easy and profitable it is to D.I.Y. (Decorate It Yourself).